Station 51 is the current mod in the Critical Jim event. You receive a message from another outpost warning you of a imminent attack on your outpost. Just as get the message, a Combine helicopter flies over and you know that it’s going to be tough. Work your way through to the Combine building and attempt to use the portal. This release is an updated and extended version of original Station 51 map. I have decided to create a new post, so there is no confusion and help users understand the difference. The name Update and Extended is unofficial. Copy the station51 folder into your SourceMods folder. Station 51 should now be listed in your Library tab. The fie above comes with a grid view image. To use it, select “Grid View” in Steam (top right corner). Make sure you have saved the image to a location on your computer – you can’t use it from the compressed archive directly. Right click on “Station 51” and select “Set Custom Image”. Then browse to where you saved the image and choose it. Then click “Set Image” and that’s it. The playthrough below is part of the Critical Jim event. Sam knows what he is doing and playing this release shows that. The original release was just a map and this is now a proper mod. I have to be honest and say without playing the original again, I couldn’t notice any significant difference between the updated version. For most, it will be the second chapter, that will be the main reason to play this. There are some really nice mapping and situations. I felt that perhaps too many Combine soldiers attacks and not enough enemy variety. The final section was nicely done but it’s hard to forget that Combine architecture is vertical and Sam’s creation, as good as it is, is just not vertical enough for my liking. In addition, I never really felt the action and excitement increase. I know some readers don’t agree with me but for me the ending MUST get more intense. All in all, another great release, but I never had a WOW moment. I’ll be surprised if you don’t enjoy this. The new 2nd map in this release is excellent, very large with some challenging combat encounters in it. The assault into the Combine structure at the end was very cool and it looked fairly unique. Aside from that little slip I enjoyed this release very much! I very much enjoyed this package of 2 excellent maps Having played the original one I decided to go trough on hard and let me tell you it certainly wasn’t easy. There’s plenty of gear to find around though great placing of crate’s! The only “complaint” I can think of straight away was the lack of a maybe connecting driving (air-boat) section. As for layout I felt his first map is superior to his second one then again the combat worked out better for the second one making up for it. The little combine outpost was a nice addition but it did end live up to the half life2 combine structures as in I wasn’t in awe by any stretch of the word. This is solid continuation to part 1, which was possibly my favourite release from last year. I only played the second part, mostly because I played the first part multiple times last year and because I am supposed to be studying right now, not playing. I know there are updates to part 1, but I can’t comment on those. As a fan of puzzles, it is somewhat puzzling (hhhehehe) to me why I like Station 51 so much, considering that it contains hardly any puzzles in it. I think the areas in which the gunfights happen are well designed. There’s a good amount of cover and many paths that the player and the combine soldiers can use. The number of enemies you have to fight is usually well chosen, save for a few times when there are perhaps too many enemies. The mod does a good job communicating the next goal to the player. I don’t recall getting annoyed by not knowing where to go or what to do next. I would like some puzzles; I think they could be used to provide some pause between the combat scenes. The area in that screenshot is also questionable gameplay-wise, because when you walk forward, you find that you have to drop into a room with a silly amount of zombies with a couple of combine soldiers sprinkled in. I am not a big fan of zombie-filled rooms in HL2 mods. Also toward the end of the mod the battle arenas become larger and have less cover in them than the previous ones do. I think this is a turn for the worse. These problems led to me choosing PIN rather than PF, but I do recommend this mod as a must-play for owners of HL2:ep2. in summary “Station 51: Updated and Extended” really deserves a “personal favourite”… and I look forward to more of sams work …well done mate ! Have you restarted Steam. Have you run Half-Life 2: Ep2 recently? Any issues? Do other Ep2 mods work? The first time, I started the mod, it gave me a missing startup_loading.vmt, which I then downloaded and placed in the corresponding folder, but now, all it does, is give me a “Could not load library client”. Any ideas on how to fix that. 1. Too many Combine waves, you dont get to rest before you have to fight another wave, and so on. Combine-ites is a dangerous disease that is contageuos to other modders. Fighting Combine isnt much fun and wasnt the highlight of HL2. Too much of it is ruiness. 2. Archtecture is too busy, and a bit mazey. There are so many different kind of structures and so many levels of them, that it looks almost too forced. Some of the strctures or walls seem out of place too. And I’m not sure that a lot of it could be a dry canal bed. 3. Too many waves of Combine. Yeah, I said it already, but when they are this thick, it deserves a second mention. 4. Enviroments are dark and depressing. 5. Many “forced battles”, not allowing the player to proceed instead of fight. Now, the good news is Sam’s tradmark of route exploits allowed, with no invisible walls. Also, his trademark of being able to fight the enemy in large areas and giving the player many battle options. Those benifits are carried over from the first chapter. But I cant help but think that so much was missed here. If half the Combine were removed, and replaced with much more “quiet time” for exploration, and a bit of light added, a few more headcrabs and barnicles instead of Combine in some areas, and a little bit of airboat…ok, now we have a mod for the ages! But the way it is now, a “Mabye” is the best I can muster. Actually I for one was able to get around at least 1 combine fight, 1 zombie fight, and 1 where they were fighting each other, it didn’t feel so forced to me. I’ll replay it tonight and see how may forced battles there are. Ok I went back in, and put on a happy attitude as well. I’m sorry, my score still stands. I was correct the first time I scored it. And 3 out of 5 (or 6) aint bad, it just aint good either. There might be a few areas that you can run past the Combine, but there are so many Combine, you would have to be super-human to get by them. I would of liked to see whole areas with the Combine removed and perhaps turrets(?) put in their place. Easy to beat and oh so much fun. Or mabye Antlions? I did like the landmine part and the barnicles right after. More of that and less Combine mabye? “More alone time” is the general idea I’m trying to get to. There are many other kinds of enemies that can be used. How’s that? There’s all the “alone time” you could possibly want, for pottering about & sightseeing – you just have to kill off the combine first! Then you can reach for your Thermos and sandwiches. If you prefer scenic mods then just play “Dear Esther” but it’s not fair on everyone else, lobbying to wreck a good mod just because you’re not up to the challenge. Arena design and combat is a difficult skill to perfect, and whilst not perfect, this is really a very good combat mod, and there just aren’t that many of them. The canal bed fight was a prime example; there were the two covered passageways either side of the central area, plus the big bulkhead to hide behind. The Combine’s AI sends them to where they last saw you, so if you’ve nipped around to the other side and are now behind them shooting them in the head, it’s simple! Same for the hunters, be nimble & they’re straightforward. Yes, if you just stand there you’re going to die, & deservedly so. However if you’re constantly on the move & use the cover provided, it’s quite achievable to overcome the numbers and very rewarding as you’ve earned the victory. Replace the Combine with turrets? What, seriously – are you joking? Who the hell wants empty arenas, & TURRETS to fight? Might as well not bother. It seems the mods author agrees with me. wow he made it into a mod now, that’s nice 🙂 I think the first map was a personal favorite, can’t wait to play this! It is dark in places. did I mention the combat? Sleep when your dead hey Sam. I really enjoyed this and almost made it a PF. Yes I have read everyone’s comments which mostly say that different people have different priorities for their favorite types of mods, eg; too much or not enough combat, puzzles, graphics and so on. Myself I just want more good mods to play at a time when they hardly exist in any form! And when one comes along this good, its like finding water in a desert. So is objectivity in doubt…..hmm. – forgot (again) I had rpg so I just used it in next area..
– AI is kinda disabled, they don’t spawn facing me and they just sit there.. has this been tested? – again, that’s a shitload of combine after I sound the alarm! – freakingly nice combination of the factory with the combine wall and interesting combine architecture up ahead, but again a shitload of combine soldiers is meh to increase difficulty and could’ve had a better boss fight.. In the end it was all a crazy ride and I was smiling and happy I could play this wonderful mod, I just wish it would’ve been given more time, attention and testing to get it to another Personal Favorite. Hey guys, Sam here! Glad you’re enjoying it, and there’s some really good feedback in here. I do wish I’d been able to get in more testing before release, but I had a hell of a time getting people to play it. I probably should have tried out the beta testing PlanetPhillip offers, lesson learned. But I did get a blind first playthrough video yesterday, and it was very enlightening. Painful, actually – it didn’t look like much fun at all. You kind of get blinders after working on it for so long – you know how you’re supposed to play it, so major issues get glossed over. I’m thinking about going back and patching with the feedback given in the second half. There really are way too many enemies, especially when they’re dumped on the player all at once. I need to go back and pare them down, and make sure the waves are staggered. This seems to be a core problem, especially in the Combine base. Some players were really hesitant to drop down into spaces – I think I need to ease the player down into space more. Example: dropping down from the bridge, jumping down in the Combine base to the teleporter. There are some empty areas, which besides looking odd, end up leaving the player without cover. Need to clutter these up. Main candidates being the gunship battle area and Combine base. More cooldown periods would be good, related to trimming down the number of enemies. I like exploration too! The map is a little dark in places, I think I need to crank up the ambient light a little. Thanks again for the review and hosting, Phillip! I think you pretty much nailed it with what I just read. I read the whole thing at MoD DB and it is very complex but interesting. Not many modders are going to take criticism (although meant to be constructive) and actually make changes. It seems you cut to the chase and imediatley can see what’s wrong. I agree, the light was a bit low, but that doesnt mean it cannot be somewhat dark. A trick that is used in some mods is the narrow combine light-lamps being left around to help the player see. This trick was used a lot (for example) in the mod “Drainage” and many other mods. The explanation for the lamps is easy: put there by the enemy so the enemy can see! They also serve to mark where the player is supposed to go next which helps. Or of course, more sunlight can be added as you mentioned. Yeah, secret places, alone time, dead end routes that contain goodies, that kind of stuff is great. Yeah the dry canal beds…I mean usually with canals (refrence Water Hazard) there are canal walls built to hold the canal in. That doesnt mean that buildings cannot be used as canal walls…kinda like a Venice Italy thing I guess…but too much of that looks unreal and a bit too busy (at least to me). And you saw excatly what I saw with the Combine-ites. I am glad, You have very great talent and not seeing something like the “too much Combine” thing, can ruin a good mod. What’s amazing is some modders are told they have way too much Combine, but…they never can see the problem. So their mods are a few notches below where they should be, and it never gets corrected. Hey, hold on – some of us LIKE combat! Personally I enjoyed the Combine challenge; I think I died 3 times on the first play through (Med) from swamping, but because of the generally excellent, complex design of the combat areas, quick and resourceful tactics can readily prevail. I hate ‘tourism” mods where combine queue up (especially at bottlenecks) or just stand around waiting to be shot, where’s the fun in that? If you keep dying, you can always play it on easy. Or fight harder! This new map really hit the spot for combat intensity, it would be a real shame to spoil it by removing all the challenges. Please consider the fighters as well as the picnickers before drastic revisions. Failing that, I’m sticking to my current copy! Battles are fine…BALANCED with some quiet time. That makes a great mod. Too many battles robs the player of the experience of soaking in atmosphere and the enviroment. This is a common mistake in many mods. Sam already pointed this out. He called it “boring”. Let me give an example of perfect balance. Play Joutomaa Redux, Planet Phillip has it. Joutomaa Redux has perfect balance. It is a beautiful mod with challenging battles, and lot’s of alone time in between. It is truley a dream for the explorer types, and fullfills the battle lovers too (for the most part). The pacing there is just right. Lot’s of freedom. I really enjoyed this expanded version and replayed the first part even though I didn’t have to. It has pretty good gameplay, excellent scenery, and a really polished feel. Considering there isn’t much new to play right now, this really hit the spot. A couple of minor points are that it would have been nice if the airboat had been used a little more, and also there were a couple ladders near the last section that you could actually just walk through for some reason. Definitely worth your time, and I hope there is more content coming from this author! Easily one of the better maps. All the levels had a good, realistic feel. Not too sparse, yet no too crowded either. Maybe a little more variety possibly but I thoroughly enjoyed my time playing it. Well done Sam Combs, will look out for his (her?) name in the future. Just played through this and I have to say I found it rather frustrating. 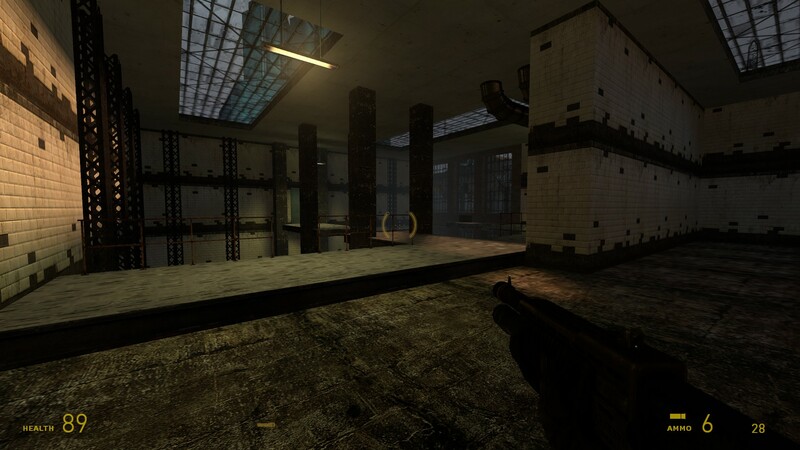 It looks great and Sam certainly knows how to get the HL2 feel about his maps. It’s the encounters that pissed me off. That’s a strong term but its true! They made me angry! Every single one of them required very little of me strategy wise, I just kept dancing round the combine blowing them away with the shotgun. We all know how to play this game and we should all be pretty darn good at it by now too, and Sam knows this and makes it tough. Tough is fine, but I’m afraid its at the expense of it being fun. Fighting a chopper is fun. Fighting a chopper whilst trying not to get blown away by rappelling combine isn’t fun. Fighting an APC is fun. Fighting an APC while about 50 combine try and route you is just infuriating. I spent most of this game, diving from pick up to pick up desperately trying to stay alive so could get another shot off. Especially in the Hunter fight in map one. Damn I’d forgotten about it, crazy hard. Also, I think this is mentioned above, there’s not really anything else to do. No puzzles to break it up at all. It really needs a bit of something else other than combine and zombies trying to kill you to balance it. With such great environments, its a shame that we couldn’t have had a few physics puzzles in there or turrets to deal with. There’s a huge set of fun things to interact with in the HL2 world. Most of them seems to have been forgotten about here. Overall, it’s frustratingly challenging and repetitive but looks gorgeous and everyone should play it. Just be ready to dance!!! To anyone having the “Can’t find background image materials/console/startup_Loading.vtf” error, I can’t seem to find a solution. A google search turns up this error happening in a bunch of different contexts for no clear reason. But you can still play the maps by copying them to Episode 2 and manually starting them. Copy the “station51_1.bsp” and “station51_2.bsp” files from the “\Program Files\Steam\steamapps\sourcemods\station51\maps” folder into your Episode 2 map folder, located at “Program Files\Steam\steamapps\*YOUR STEAM ID HERE*\half-life 2 episode two\ep2\maps”. After copying the map files over, start Episode 2, open the console with the tilde (~) key, and type “map station51_1” without the quotes. This should bring up the map. If tilde doesn’t bring up the console, go to: Options > Keyboard > Advanced > Enable Developer Console (~), and check this box to enable the console. This should let you run the maps. The only difference is it will run the Episode 2 credits at the end instead of mine, but you’re not missing much. Sorry for the trouble, hopefully this at least lets you play the maps. I’ve definitely played the first part before, and I enjoyed it this time too although I can’t be sure how much different it was. The first part has a pretty good balance of combat and downtime, although I think it goes into heavy combat way too quickly. The zombie interlude and chopper bits were blended into the experience as well and the way later environments link up with previously visited places works well. Most people have probably already played that map though, so the new one is what’s most important. Personally I didn’t like it nearly as much. Firstly, the environment didn’t seem to make sense to me. At points it was like a city, although the previous map looked like it was in the middle of a forest. The way all the buildings were meshed together didn’t look quite right to me and I couldn’t imagine it existing in real life. Then again I thought the Combine base was awesome, especially all the asymmetrical walls and floors near the entrance. I did have a problem with the combat in this map. I have to agree with Blue Lightning in that there are way too many Combine soldiers and not enough downtime between them. It got to the point where I was reluctant to enter large areas, because it was clear that loads of enemies were about to run in. I had to turn down the difficulty for one area where you drop down into the canal-type thing. Despite the issues I had, the whole package is enjoyable and I’m sure some small tweaks could really improve the second level. Station 51 is one of the most enjoyable combat-oriented mods I’ve ever played. The levels are designed to make the most of the Combine’s (somewhat lackluster) AI: expect Combine soldiers to flank you; expect them to flush you out of cover with grenades; expect them to surprise you by rappelling down from above; expect soldiers on high ground to provide suppressing fire for soldiers below as they close on your position. Combine combat was also nicely varied, with combine APCs, gunships, hopper mines, and hunters incorporated. If you need a break from Combine combat, then take some zombies! The author knows that the best number of zombies is way too many zombies; he fills mid-sized areas with the things, then gives you lots of physics projectiles to throw at them. My chief complaint with the mod would be its samey-ness. The entire hour-long romp is set in heavily industrialized areas, which get boring after a while. There also wasn’t much time to breathe between battles. Expect this mod to challenge you! This mod is really cool and is centered in almost pure combat terms, so the battles are always intense all the time, when I first played it, the first section was so cool and even surprising at the end, there were some awesome battles with more than 2 Hunters involved which I really love in any HL2 map or mod. Now, the extended section in this mod is also really nice, I liked the environment where you are into, this big industrial complex in wrecks and then to get into the CMB fortress in order to reach the teletransporter, through a big warehouse filled with many containers, now due to the combat scenarios you can easily move around or plant some combat strategy. Overall I guess this mod is one of the best in this season so far, it provides fun combat and a great gameplay time, tough I guess I want to see more mods from this author, I believe he can do a bigger and some awesome mod, I hope he’s planning to continue modding for hl2. This is the full mod version of Station 51, having two chapters. The first is the original map with two changes. Firstly, the part where the Hunters drop from the roof has another section where the door breaks open and two MORE hunters appear. This is a good design choice because originally the battle was ridiculously easy due to having a rocket launcher full of ammo. The second change is that at the part where you pick up the Grav Gun a combine force field is added. It’s a standard Citadel-esque “shoot the energy ball and the path opens”. This was added because you need the GG in chapter two. Since I already talked about this part of the mod in my review of the original map, I’ll skip ahead to chapter two. The airboat you get is pretty pointless since you leave it pretty much instantly. Other than that I love this chapter. The style of it is kind of a cross between the HL2 chapters “Route Canal” and “Water Hazard” (without the airboat of course). It is very well decorated and pleasing to look at. A memorable part for me was going through a slightly maze-esque place filled with zombies and getting to an arena of Combine and Hunters. Then you backtrack and the maze is now filled with Combine. Pretty clever in my opinion. The last part of the mod is more like the Citadel, except with actual guns instead of just the Supercharged Gravity Gun. It’s very fun to play through but is mostly just wide open areas filled with Combine. Could have been more thought out; the ending is really lazy as well. You go through a portal and it says “Subject Status Unknown”. Overall, I would say play this mod. It’s great and fun. Can’t find the vtf at the start and crashes. Is there any kind of fix for this by now? I’d love to replay this – I know I *had* played it, and more than likely had reviewed it at one point, but I can’t find any evidence of that. It looks like this version doesn’t have the SteamPipe fix. I’ll drop Phillip a line about it. Sorry about that. I installed via MapTap and that automatically updates most mods to work with the Steampipe changes. so i tried installing both manually and with map tap and still get error messages , one about updating hl2 and after that something about failing to load the library file? Try playing Half-Life 2. That solved problems like this for me. Heh, been playing the Update instead. I’ll load up hl2 and see whether that helps this. Thanks Phillip. just went back and updated everything and defraged and talked nice to it and now it works. Still not working for me, ran HL2 and still got the same cannot find vtf. :/ I had the original as a PF, found my review, so I’m really looking forward to playing this. I haven’t reinstalled Maptap because I’ve got my steam files in a variety of places, and when I last tried using it, it choked on where I’d put them. But manually this should work along with all the other source mods that are in the right location on my drive, it just doesn’t. Go into the mod’s folder and rename any background maps. Just put an “X” in front of the names and try loading the mod again. This is a good mod and well worth a playthrough however it is very repetitive and gets quite dull by 3/4’s of the way through. The main issue is the combat, with the same scenario being repeated over and over again. Sam relies on sheer weight of enemies to create difficulty rather than designing challenging scenarios. The high volume of item crates available means the player is never really in any real trouble however. The mod looks good with a slightly abstract feel to the environments which i personally quite liked. Its a sort of hyper realistic industrial area that seems to serve no purpose that can be easily identified unfortunately but that didn’t bother me. Good stuff. Clean mapping skills. Things are not placed at obvious places, but you can always find your way out. I really liked the small secrets. My only complain is the short lenght, and the ammount of combine soldiers. Needs more variety on the enemy type.